Curtains - They no longer have this color. One of the things dh and I have discussed is getting an oriental rug for our living room. You know, a real grown up rug. Something we would really love. Above I put one rug I found online that fits that criteria. I REALLY love it. It's the right size: 9' 6" x 13' 9". I love the pattern and the colors. So beautiful, right? I love how it looks with our Chesterfields next to it and I slapped a coffee table on there that is similar to the one I have been thinking about for our living room. Here are some accessories that I think would go really well with this look. Most of these, I already own. Large basket from Homegoods. Similar one here. Oh Ranarp floor lamp, when will you be in stock at my local IKEA. When? Yes that little white end table is really B's old kid's play table from IKEA. $15 for an end table. Can't beat that right? Back to the rug shopping. Here is another reference rug I have been looking at. I have been pinning them to my Pinterest board Living Interiors. The thing is that I can't really be buying a rug like this online. Unless it were a VERY reputable place where I knew I would get my money back and have shipping paid both ways. Does that even exist? Red colors especially are so difficult to depict in online photos with any kind of accuracy. Here is one I found on Esalerugs.com. I think it is a little bit on the busy side, but the price is definitely right. It is a new rug - less than 10 years old, which is also why it is at the more inexpensive end. If you can call $1735 inexpensive. For an oriental rug it really is - see further down this post for some true sticker chock!. 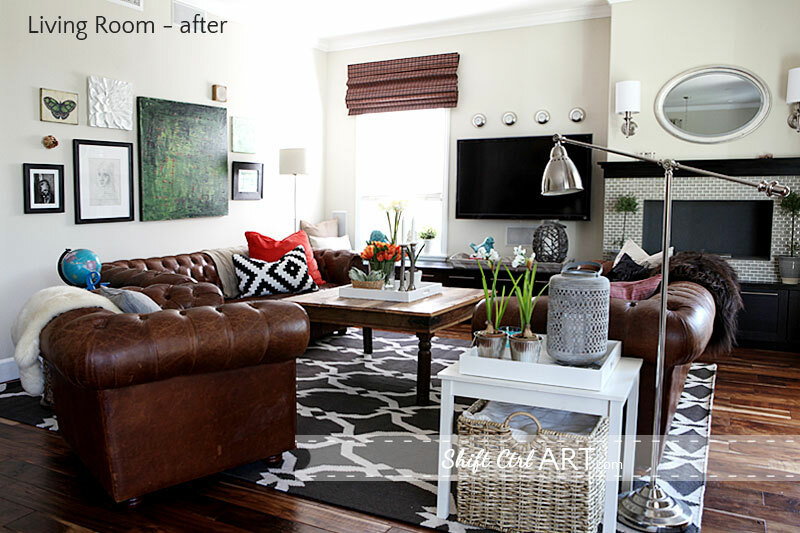 Here is a picture of that same rug in a modern furniture setting also from Esalesrugs website. Here is another rug from them. I like this even better than the one above, but I still think it is just a tad on the busy side. I love that it does not seem to go too purple in the red color, but that could be all photo trickery. So I have been heading to a couple of local rug stores. Some of them are complete rip-offs with horrible rugs. Ugly colors and patterns. That's probably to be expected. Then on Monday I found this store with actually several rugs that I liked. Of course the rug that we want, have to fall into the right mix of size, color/pattern and price. First up a rug that we didn't even unfold because of the price tag. The price shown here is of course not final. They never are. Right off the bat there is a 40% discount. Still that is way, way out of our budget. Next up, I looked at this rug. This has the "original" price of $7000, which means $4300 to the rest of us. After showing some more interest in this rug, which was the right size: 9x12, the price got knocked down further to $3000. I sort of like the pattern, but it is reading a little bit Art Deco to me, which I am not personally that drawn to. Also the accent color in it is light green, which is not my favorite. It looked better in person, but now that I see it in the picture, I definitely know it is not the one for us. It also has too much white in it. Here is one more from that same store. This is only 7x10, but look at that pattern and those colors. This rug is so beautiful. This is much more to my liking. Of course it is too small and that is something I will not compromise on. It was also on the more expensive side at $3400. This was after the 40% off, but before any negotiating. Why couldn't that rug be 9x12? Something I have found very helpful is to bring images of patterns and colors that I like. That cuts right through time wasted looking at all the kinds of rugs you are not really interested in while making helpful comments like: I like the pattern to be more transitional with better relationship between hues. That usually just yields a blank stare. A picture is really worth a 1000 words when it comes to oriental rugs. This article: Living room on my mind - rug hunting first appeared on http://ahomefordesign.com.